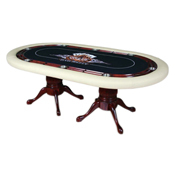 Brand-new handmade Oval and Round shaped Texas Hold'em Poker Tables. Seats 10 players (or 8 players on the 54" round table) for Texas Hold'em poker table. 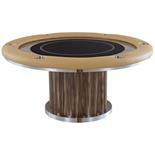 These professional poker tables feature 10 (or 8 for 54" table) removable brass or stainless steel drink holders and double chip tray perfectly milled to seat casino grade chips. A banding of decorative brass heads are inlaid in a hardwood strip and highlights the black cushioned armrest. The playing surface consists of a high-density cushion, covered in a plush suede-like velvet. The two solid hardwood pedestal legs complement the artwork of the entire furniture game table.